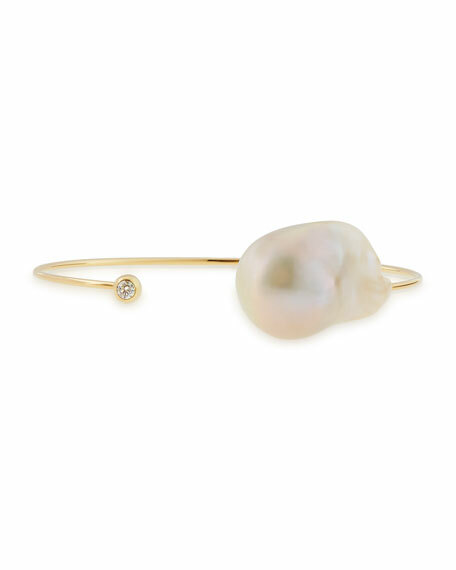 Mizuki narrow pearl and diamond cuff bracelet. Naturally white freshwater cultured pearl. Single bezel-set diamond, 0.08 total diamond carat weight. Gap for slip-on style; very slightly adjustable. Made in the USA of Japanese material. Mizuki Nagasawa was born in Tokyo, raised in New York, and trained in sculpture at the School for Visual Arts. The Mizuki collection, introduced in 1996, features jewelry with sleek movement and powerful shapes that reflect her fine arts background and Japanese heritage along with the cool of New York's SoHo.